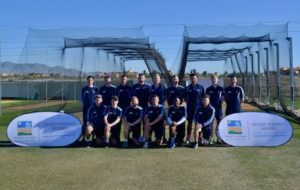 Hartley Country Cricket Club players are now back in England having completed a successful four (4) days of warm weather pre-season cricket and fitness training between Thursday 30th March – Monday 03rd April at Desert Springs Resort, Europe’s only international award-winning luxury family resort and championship desert golf course with its very own dedicated Cricket Academy, in the Almanzora region of Almeria, Andalucía in south-east Spain. Sixteen (16) players between the age of 17 – 39 years completed bowling, batting and fielding practice as well as strength and conditioning training sessions as they stepped up their physical preparations for the upcoming 2017 season. The training camp worked on a specific and carefully planned programme covering technical skills, strength and conditioning and both individual and group activity that included golf on the championship Indiana course! The players and coaches were accommodated in some of the privately owned apartments and townhouses normally reserved for holidays and short breaks at Desert Springs and the resort’s executive chef was on hand to cater for the special dietary requirements of individual players dining in the award-winning El Torrente Restaurant.